I had this very tall, blank wall on the side of my refrigerator that was needing some love. Being that we spend the majority of our days at home in the kitchen/family room, and the counters can easily become a dumping ground for mail (bills, magazines, cards) and other paperwork, I decided it was the perfect spot for a command center. The bottom portion of the wall contains three sets of wall pockets from the Container Store. They are clear so I dressed them up a bit with some pretty paper and vinyl lettering. In each of our pockets we have an “info” file and an “action” file. Info is for things that give information but need no response or action. 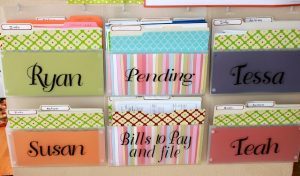 This works well for the kids especially because once they are in school they are constantly getting paperwork sent home that is sometimes just for informational purposes that you may need to hold onto for a bit. This folder gives those types of things a home. The action file is obviously for things that need action such as something that needs to be signed or sent out, etc. The Bills to Pay and File pocket is pretty self explanatory. I again keep two different file folders in it to separate things that need to be paid or taken care of from things that need to be filed away. The Pending file is for things that are…pending. This is a partial tickler file system. It contains 1 file folder for each month of the year. This has been so handy for all of those things that I need to take care of or reference at a later date. For example: I knew we were getting our roof redone but not until later in July. So all the roof info goes into the July folder. When I run across ideas for my daughter’s birthday party I put them in the October file. Then at the beginning of the month I take the folder out and deal with its contents. This system has worked well for us and I’ve tried a bunch. It gives everything a place–rather than the kitchen counter. The one leftover that I usually have from the mail is magazines. These either go in a basket on the end table by the couch or on my bedside table because those are the places I will sit down and read them. (If/when I get the time. ? The one must with this (as with just about any system) is that it has to be maintained or these pockets will become stuffed and therefore unusable. That leads me to the next areas of the command center. This area contains a small bucket of pens and other supplies that are needed often, a magnetic message board where I often keep a to do list and sometimes a shopping list, and a giant magnetic family calendar from Target. (It looks like they may have discontinued it but here is something I found that seems similar only instead of monthly it is weekly.) Each square has 5 blank lines (1 for each family members–including the dogs) and a line for the meal that day/night. Helps to keep everyone’s crazy schedules in one central spot. Once the mail comes in, I look through everything and write down pertinent information on my lists or calendar and then decide whether I need to keep the paper or get rid of it. Above my calendar is a large bulletin board I covered in fabric and ribbon (just to make it pretty). There I keep my cleaning calendar and any other schedules or calendars I need to reference often (it’s summer so we don’t have too many schedules right now). I will sometimes place an invitation up there if I need to keep it for some reason. Often times, I just write it down on our calendar and get rid of it. The less paper the better. The very top of our command center is our time zone clocks. Both our families live in different states and time zones. I thought this would be the perfect way to keep track of that. I decided to make a little sign on top and give this area a name. Since this sort of our central hub, “Waterman Central” seemed fitting. Tip of the day: Color Coding. As you can see each of our wall pockets is a different color. I am a very visual person. I use this with our calendar as well. Each family member is written in a different color (the same color as their wall pocket). Everyone knows which color is theirs which makes it very easy to spot quickly on the calendar.